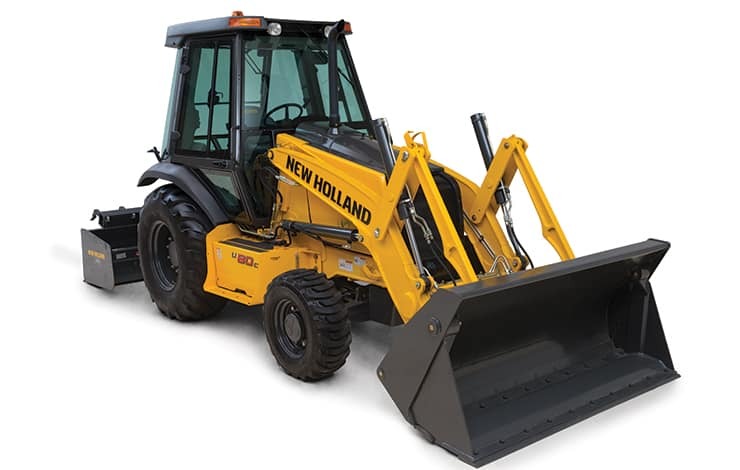 The New Holland U80C tractor loader provides profit-making power on both front and back. The Tier 4 Final engine delivers the responsive power you need for loading and grading while reducing emissions. The curved-arm loader linkage provided on the U80C tractor loader provides hydraulic bucket leveling for less spillback, as well as excellent reach at maximum dump height for truck loading. The unique reverse-mounted loader arm cylinders give you maximum bucket breakout force and superior dump speed on the bucket. Rugged Class II three-point hitch with controllable down pressure provides excellent scraping and leveling performance. The synchromesh transmission with power shuttle gives you smooth control and easy forward-reverse shuttling. The large, efficient, flat-deck operator platform provides easy-to-use controls and unobstructed views for outstanding visibility.